Depth perception refers to your eyes' ability to focus in on an object and calculate approximately how far away it is. Several conditions -- including lazy eye, light deprivation and having one eye that is more dominant than the other -- can compromise your depth perception. With regular eye exercises, you might be able to increase your depth perception. 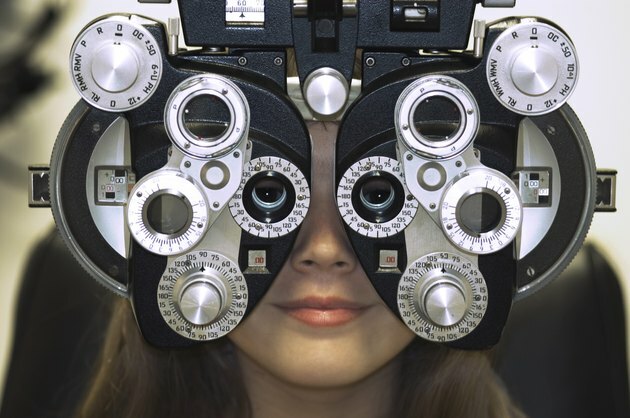 If you have concerns about your depth perception, make an appointment with an optometrist. Hang a balloon or beach ball from the ceiling using rope. Hang the beach ball so that is hangs approximately 2 feet from the ceiling. Use your hands to bat the balloon or beach ball back and forth from left to right. This will help your eyes focus on precisely where an object is. Use a flashlight in a dark room. Take a flashlight and have a family member or friend make patterns on the wall. Patterns should go to the left, right, up, down and diagonally. Follow the patterns closely with your eyes. Complete mazes, word searches, puzzles and hidden picture games to help your eyes focus. Try pencil push therapy. Commonly recommended by ophthalmologists, push pencil therapy involves holding a pencil -- or pen -- directly in front of your eyes. Hold the pencil and arms-length away from your body. Slowly move the pencil inward to your nose while following the exact movement of the pencil. Moving the pencil too close to your nose will cause you to draw on yourself. Take your eyes through their full range of vision. Sit with your head straight and your eyes opened. Look up, down, to the left and to the right without moving your head. Practice vision exercises two to three times per day in five-minute sessions. If depth perception is only a problem in one eye, your optometrist may recommend eye patching. The dominant eye will be patched to help strengthen and increase depth perception in your weaker eye.